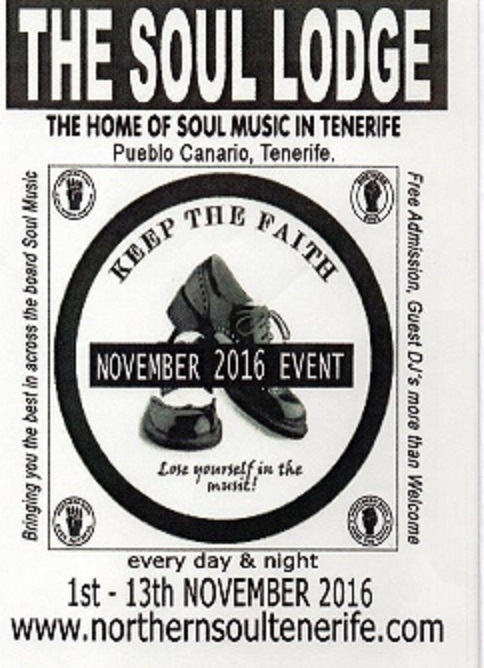 Northern Soul brings you a fabulous line up of Guest DJ’s every day and night from the 1st to the 13th of November at the Soul Lodge - the home of soul in Tenerife in Pueblo Canario. DJs include Paul Entwistle from The Soul Train Show on Ocean Radio, Stevie Chew from Cleethorpes, Tony Jackson from Charity Soul, Ron Lavender from Whitby plus many more. For more info visit www.northernsoultenerife.com.